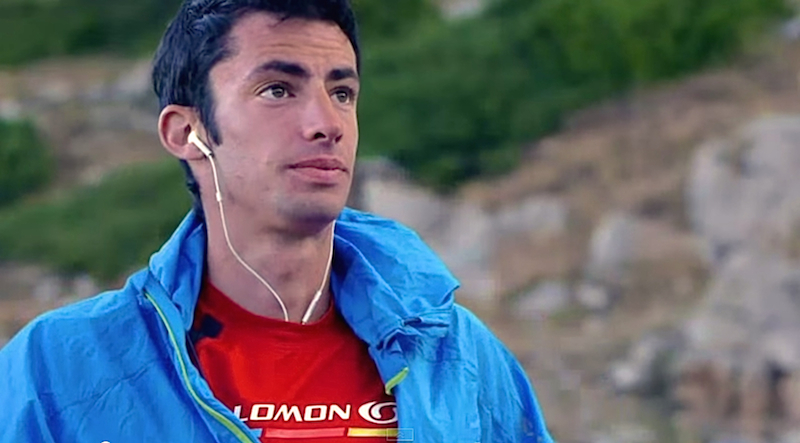 The top ultra-runner on planet earth – Kilian Jornet Burgada. It’s almost a shame to categorize Kilian Jornet Burgada as just an ultra-runner, he also skies, mountain bikes, and runs Sky Races on the circuit. He has some exceptional vertical mile times, and sometimes does a Sky Race within days of a 50 or 100 mile race on the trails. He said he recovers from the grueling 100 mile Western States race in just two days. Kilian much prefers running trails on the mountain. Flat trails and anything paved – brings him down. Down as in, he lacks motivation to run such terrain. Kilian is a virtuoso on the mountain trails. He has seemingly infinite stores of energy and speed for distances of 100 miles or more. His descending speeds over technical terrain are absolutely legendary. Someone remarked that watching Kilian descend a mountain once, they thought he was falling down it, he was so smooth and fast. Crucial tidbits about Kilian follow in a bulleted list below, then some more information about his race results over the past few years. Languages Spoken: Spanish, French, English ((( more? German? Dating: Emelie Forsberg, one of the top female ultra-runners in the world, also on the Salomon Running Team. VO2Max: One of the highest ever measured in human beings – 92 ml/kg/min! Diet considerations: He said himself he survives on pizza, sandwiches, and Nutella! Training Weeks Typical Vertical Gain: 10,000 to 20,000 meters (32,808 to 65,617 feet) during 30 hours of training. During the week before a race, typically about half that, he says in the video below. But then he states that the week before the Western States 100 mile race he put in 35 hours and 22,000 meters (72,178 feet) gain. During a typical season, Kilian puts in 1,000 hours of training and 520,000 meters of vertical gain. That’s 1.7 million feet of gain! Kilian drew up a list of mountain peaks he wanted to attempt running the fastest known times for. Mount McKinley “Denali” – On 6/2014 Kilian set the fastest known time for ascending and descending this 20,237 feet (6,168 meters) mountain peak in Alaska, USA in just 11 hours and 40 minutes, breaking the previous record by 5 hours and 6 minutes. Matterhorn Peak – Italy – On 8/2013 Kilian set the fastest known time for climbing up and down the Matterhorn’s 14,962 feet (4,560 meters) peak in a record time of 2 hours and 52 minutes. This surpassed the previous record set in 1995 by Bruno Brunod. Kilian made the summit in just 1 hour 56 minutes using the Lion Ridge from the Italian side of the mountain. Video of part of the ascent – Kilian’s Matterhorn Record. Mount Kilimanjaro, Tanzania, Africa – held by Simon M’Tuy 8 hours 27 minutes. Here is a documentary about Kilian breaking the record. The video is in English, Spanish, and French. He is guided up the mountain by the previous winner. Mt. Everest – In 2015 this will be the final attempt at an FKT in the Summits of my Life series. Mt. Everest is, of course, the highest peak in the world. Kilian will attempt the fastest time up and down. I wouldn’t bet against him! Aconcagua Peak, Argentina – In December 2014 Kilian is planning on a FKT attempt here. This peak is the highest mountain in the Southern and Western Hemispheres topping out at 6,960.8 meters. It is part of the spectacular Andes mountains range, in the province of Mendoza, Argentina. Elevation: 22,841 feet (6,962 meters). Will update as I get the info. 1st, Pikes Peak Marathon, Colorado, USA. The strongest one does not always win, as there is a very important mental aspect. I think that the most important thing is to try to fool your mind in order to distract it.